For some time I’ve wanted to try my hand at a fabric book. Wasn’t sure how I would go about it so I visited Monarch Quilts in Genoa and Jane gave me some pointers on how I could age fabric and print photos for the book as well. I bought my supplies and took it all home to play. Well, long story short – nearly three months later the book is finally finished enough for class and class is scheduled! I am so in love with this book. There’s plenty more I think I might add down the road but the basics are here and it’s a good start for anyone who wants to try their hand at a simple-sew fabric memory book. 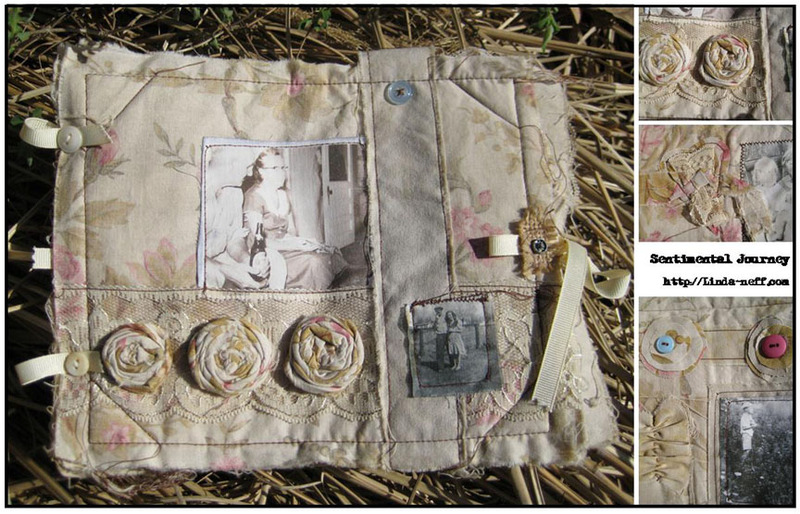 I’ve used heritage photos of my mother’s family and they fit so well into this nostalgic fabric book. I really just love to sit and look through it. The photos conjure up so many memories from my own childhood. We’re running the class is two sessions. The first session will be fabric selection and instructions for prepping your fabric and printing your photos to bring with you to the second session where we’ll assemble and embellish the book. You do not need advanced sewing skills for this class – but you will need a sewing machine. We use basic straight-stitching and you can add zigzag if you like. This is a great workshop for those wanting to dabble with fabric and photos. Watch for final workshop details to be posted soon. I still have to get all the info to Jane at Monarch. I was just so excited to show you – I couldn’t wait! Hope you like. Just Beautiful Linda.. So when is this going to be a class would love to do that project. You have to be so excited on how it turned out. It should be April 30 and May 7. Just need to confirm hours then I’ll post for sure. Thanks! Oh, Iike this idea!! What a way to use up scraps from quilts also. May have to look into taking this one! It turned out beautifully! Like your play on words Robin – too bad I couldn’t think of that! Thanks! I can see why you are sew happy with this fabric book! Nice job!! !